Just over three months ago, long-time Hays Aus/NZ Managing Director, Nigel Heap was announced as the new MD for the troubled Hays (UK & Ireland) business. 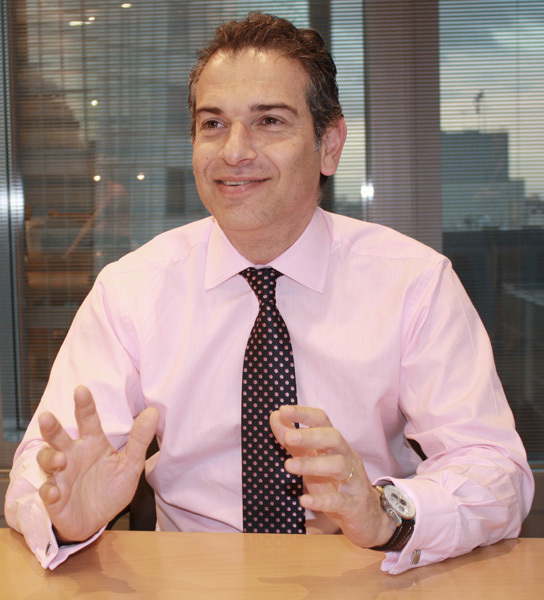 At the same time it was announced that 19 year Hays veteran, Nick Deligiannis would be moving from his regional directorship position into Heap’s old role. Deligiannis gave me an hour of his time recently and we had a wide-ranging conversation about his background, the Hays model for success and his plans for the future. It was clear to me that the Deligiannis-led Hays would be just as much a force to be reckoned with as the Hays his predecessor led and that the aggressive growth and people development focus of Hays in this region would continue. Ross: Congratulations Nick on your recent promotion to the top local job in Hays. Could you tell me a little of your journey to reach this point in your career? Nick: I joined Hays in 1993 and started on a Melbourne accounting and finance desk and since then I have had many roles and been fortunate enough to gain many opportunities along the way, which is something the Hays culture is all about. About a decade ago or so I was promoted to run Hays Victoria which led to me joining the local Hays Board in about 2004 and gradually taking on more responsibility culminating in my most recent role as Director responsible for Victoria, South Australia, Tasmania and the Northern Territory. What attracted you to recruitment in the first place? Prior to joining Hays I worked in marketing and HR having studied psychology previously. I was attracted to recruitment because of the assessment side and also the sales and marketing side. I particularly enjoyed interacting with customers to build a commercial relationship. Even in those early days I always thought there would be a career for me in recruitment. It was an important job to get right and I enjoyed the challenge of helping clients make good recruitment decisions and helping candidates secure the right job for them. What previous role at Hays provided the steepest learning curve for you? How did you deal with this challenge? I found the time management challenges tough to start with because it is such a busy, multi-faceted job with many different issues to juggle each day that required careful planning and prioritising. The second issue was building commercial nous. I remember thinking after six months in the role how much progress I had made in understanding business, recruitment and candidates. I had a lot to learn in this area, very quickly. What are your major responsibilities as the Hays (Aus & NZ) MD? I am responsible for the Hays Australian and New Zealand business which is a $1.4 billion dollar business with about 900 consulting staff and between 400 – 500 non-consulting staff across our 35 offices. Managing our people internally is the most critical role. On the local board there are five operational Directors plus the Finance Director, Marketing Director and HR Director, who are all my direct reports that I am responsible for leading, supporting and managing. Indirectly I am responsible for another 40 Directors across Australia and New Zealand and all their direct reports. We have always been about the culture so a critical part of my role is to make sure our culture stays strong. The second major area is ensuring, externally, that everything we are doing is meeting the needs of the markets we service, whether candidates or companies. This is about ensuring we understand what they see as value and delivering that value to them. It’s not just about service, it’s also about compliance and regulation. We also monitor very, very closely our customer service performance and ensure that all this feedback is given back to our leaders and trainers to ensure we replicate and enhance what is working and as well as improve areas that aren’t working as well as we, or our customers would like. Like all career recruiters I am sure there must be days where you miss working a desk. How do you stay in touch with what’s happening with consultants, clients and candidates at the coal face of Hays’s operations? I really enjoy that aspect of the job so I am constantly talking to our people, right from our trainees with less than six months experience to the members of the Board. Also I am constantly talking to our major customers, as well as receiving formal feedback from them. I do both these things to ensure I know what the current issues of concern are for both our people and our customers. Nigel Heap has been incredibly successful as Hays (Aus & NZ) MD. What are the most significant things you have learned from him? Nigel has been a massively influential individual in this business, as well as in the industry as a whole. I have worked very closely with Nigel for the past decade. What I really admire about him is his ability to cut to the chase on any issue, to brush away the peripheral issues, focus on what really matters and make a quick decision on how to deal with the issue. The other big factor is Nigel’s massive belief in the Hays people. This has really rubbed off on me. He has had a very strong focus on the Hays culture. A culture of attracting the right people, developing these people, giving them the tools they need to be successful and giving them a career path. Hays are renowned for their investment in their own staff recruitment, training and development. How do you track the effectiveness of such a significant investment? Ultimately it is about two things; consultant performance and leadership development. I need to see a return on investment, not just financially. One of the things we are most focused on, and proud off, is the culture of internal leadership development. Leadership is a huge part of our business success. For example, just in Victoria we have around 35 managers in our business of which 95% of them have been developed internally. Under Global CEO, Alistair Cox, there has also been a very big investment made in technology. What difference has this made to Hays locally? I believe we have the best system in the recruitment world, bar none, for capturing and accessing information. This gives us a very big competitive advantage. We are also very focused on the digital space, incorporating our website functionality. We have global co-ordination on these issues so we are constantly reviewing our technology and use of technology to understand how we can be even more effective in delivering what’s required and expected of us. Where do you see things such as LinkedIn and assessment technology fitting into a recruitment consultant’s future? LinkedIn could be a threat or it could be constructive for our industry, it depends on how we use it to provide a better service to the client. With respect to assessment tools, they have a place in the process but I don’t think they will ever overtake the skills of a genuine expert recruiter who thoroughly knows his or her market and his or her candidates. Have the core competencies of a recruitment consultant changed over time or not? I don’t think so. The core skills continue to be communication skills; the ability to ask the right questions, to probe, to follow up and to understand and manage the expectations of both clients and candidates. You then must have the customer service attitude and work ethic to continually deliver the level of service that both clients and candidates expect. Firstly to continue to grow the business. If we do this then we continue to provide a compelling ‘What’s In It For Me’ for all our people through greater opportunities and that keeps our culture strong. The other core focus is quality service. We want to continue to build our position as a trusted advisor to both our clients and candidates. What do you see as the biggest challenge for the recruitment industry in the next five years? I am very optimistic about the future of both our business and the recruitment industry. We need to continue to understand what our customers want and need and then service that need at a price they see as value. Servicing tightly defined markets and building strong relationships within these defined markets will always be the key to staying successful as a recruiter. Well my family keeps me busy. I have a 13 year old daughter and an 11 year old daughter. Also as an ex-state league soccer player I love to keep up my involvement in the game so currently I am coaching a VSL under 17 team. Combined with work, there’s not much time for anything else!